I've never seen Slick Rick perform. I bought his first album on cassette when I was in elementry school because of the track that was on Def Jam Classics Volume One. His first album is great though I didn't go for all the raunch but I did like the wit and unique style of flow. His second album is not as great, it has maybe 2 or 3 good tracks. Then Slick Rick went to jail for shooting his cousin. When he got out he was probably more famous than when he went in and lots of rappers were citing him as an influence or one of the all time great MCs. There was a comeback album which I never got around to buying yet. 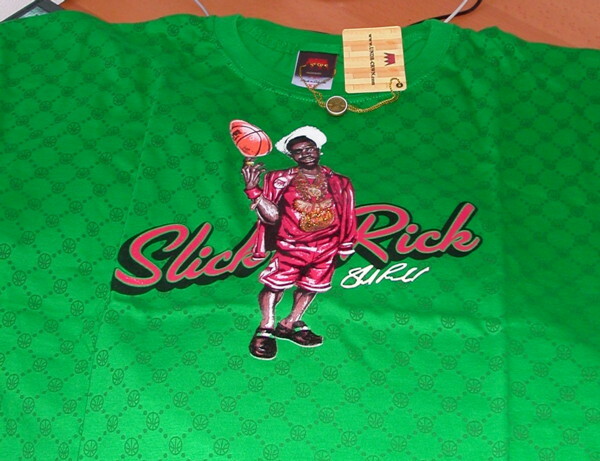 Anyway when Undrcrwn did their East Coast VS West Coast all stars t-shirts of course I bought Slick Rick.